IMS architecture promises to bring a completely new world of voice, video, and data. Even the voice part of it will be something wildly different from today as vendors start talking about quadplay networks (land-line, cellular, video, and data) instead of triple-play. In fact, the Service Provider's (SP's) need to highlight the combined offerings of multiple voice technologies underpins the amazing transformations that we can expect to see - a world of seamless communication regardless of the access network. While it is easy to get caught up in the hype and possibilities, there is another side to the story. 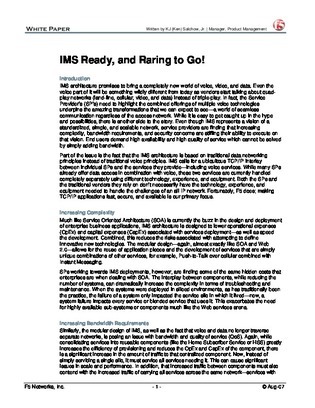 Even though IMS represents a vision of a standardized, simple, and scalable network, service providers are finding that increasing complexity, bandwidth requirements, and security concerns are stifling their ability to execute on that vision. End users demand high availability and high quality of service which cannot be solved by simply adding bandwidth. Part of the issue is the fact that the IMS architecture is based on traditional data networking principles instead of traditional voice principles. IMS calls for a ubiquitous TCP/IP interlay between individual SPs and the services they provide - including voice services. While many SPs already offer data access in combination with voice, these two services are currently handled completely separately using different technology, experience, and equipment. Both the SPs and the traditional vendors they rely on don't necessarily have the technology, experience, and equipment needed to handle the challenges of an all IP network. Fortunately, F5 does; making TCP/IP applications fast, secure, and available is our primary focus.